On 21 September 1999, a gigantic earthquake struck Taiwan, destroyed many buildings and took away many lives, as cruel as all other natural disasters. We cannot escape the wrath of such disasters, but only learn valuable lessons from each experience and improve ourselves each time. 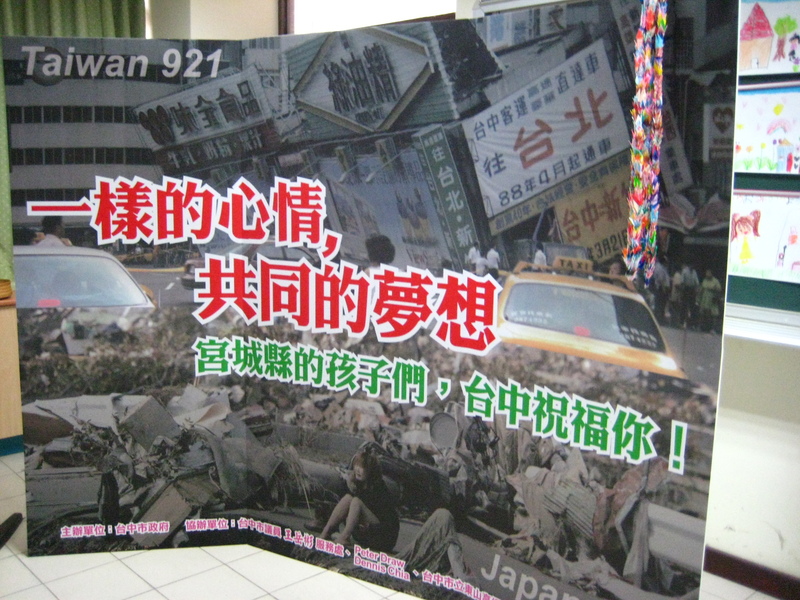 During the 921 incident, the Japanese rescue team was the first to arrive at Taiwan, bringing hope to the distraught people, as well as to the rebuilding of the destroyed cities. 12 years later, an even more disastrous catastrophe befell upon Japan- a mammoth earthquake, a resulting tsunami that devoured many coastal towns, and both disasters damaged nuclear plants in Fukushima, causing nuclear leakage that dispersed all neighbouring towns. This time, Taiwan grasped this opportunity to repay what Japan had done for them: Taiwanese citizens gathered together to raise an astounding 6.4 billion yen for the Japan disaster. One day, a Taiwanese friend of mine, Bush, told me he wanted to play a part in this project, and so we gladly accepted. He and his father were the ones who suggested to us this whole idea of bringing Taiwan, especially a country that has had experienced similar disasters, to play a part in this project. An excellent idea, and with the help of him and his father, nothing could have gone smoother. When we do good deeds, people are willing to draw out money to sponsor us. Our accommodation and most of our transport were covered by the city council. 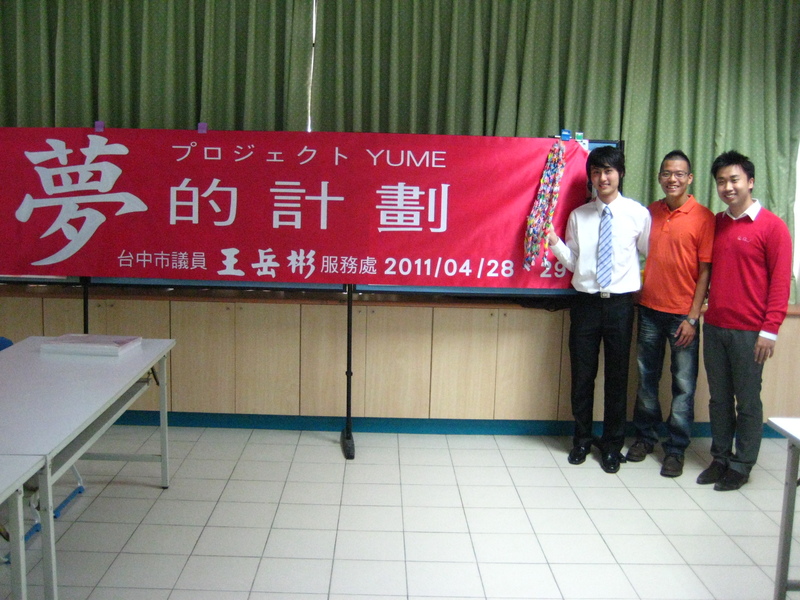 They had done all the hard work to get two schools to join Project YUME. 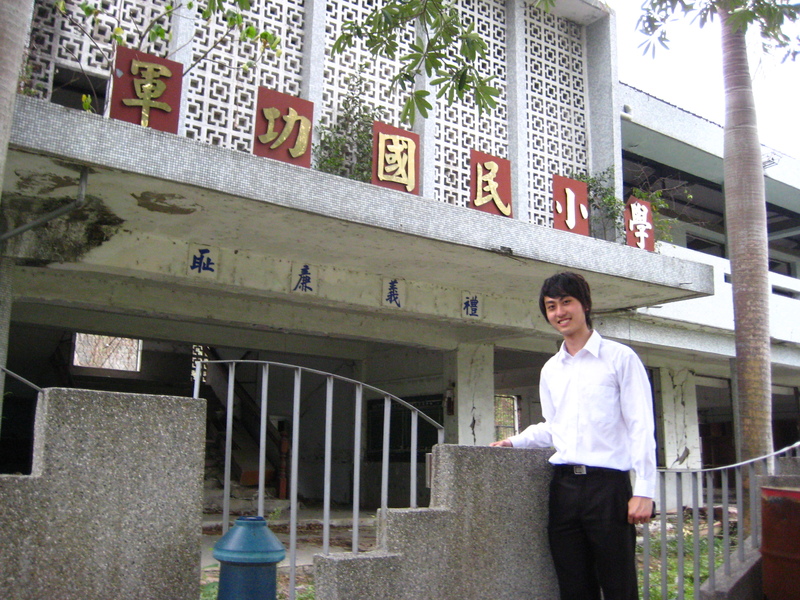 These two schools were specially chosen because both of these schools were destroyed during the Taiwan earthquake and rebuilt since then. Although most of the students now did not experience, or were too young to remember much of it, it would be something really special if they, as past victims, could draw a well-wishing picture and message for the children in Miyagi Prefecture. After coming back from Miyagi Prefecture with WAVOC (see previous entry) and reaching home close to midnight, I went to bed at 2am, and woke up at 4am in order to catch the first train to the airport, to safely board the train to Taiwan at 7am. It was a mad rush. I missed my first train, but still managed to get to the airport and check in on time. After arriving at Taipei, I took a train down to Taichung and met up with Peter, Bush and Quentin, with whom I headed off to Bush’s father’s office immediately. With all of Bush and his father’s experience and capabilities, we had our banners, backdrops and equipment all ready within a day. What I had done so far was begging volunteers at evacuation centres to let us in, letting Baba sensei to contact the elementary schools for us, talking to the principals but letting the schools do their own activities. This is the first time I would be entering a school, standing in front of 100 students, and talking to them personally about this project, and then watching them draw on the spot. This sounded really promising. Our first stop was at Jungong elementary school. For the first time, Project YUME had a banner of its own, all thanks to Bush and his family. Even though I played no part in the making of the banner, I felt a sense of achievement seeing something that I created being printed on such a huge piece of cloth. And this backdrop was order-made almost instantly too. The top half of the backdrop shows the collapsed buildings after the Taiwan Earthquake in 1999, whereas the bottom half shows the total devastation of the entire town in Miyagi Prefecture. The words in the middle say, With shared sentiments and common dreams, Taichung wishes for the best for the children in Miyagi. This was the little speech I made at Jungong Elementary School. Of course, the school principal, as well as Mr. Wang (Bush’s father) made their speeches too. After me, Peter told the ever-inspiring story of himself, followed by a story to bring up the mood, as well as to teach them an important lesson. Then the main activity started. The children started drawing. We collected a total of 87 drawings from this group of children. The first full set of drawings collected in this project so far, from Taiwan, ironically. After the school visit, we went to the Earthquake Memorial Park, where the old Jungong Elementary School stood during the earthquake. Even though much of the school had been damaged, it has been preserved since then, as a memorial and reminder to us that disasters can happen anytime, and we should be constantly aware of its prowess. The first day ended at a night market in Taichung. 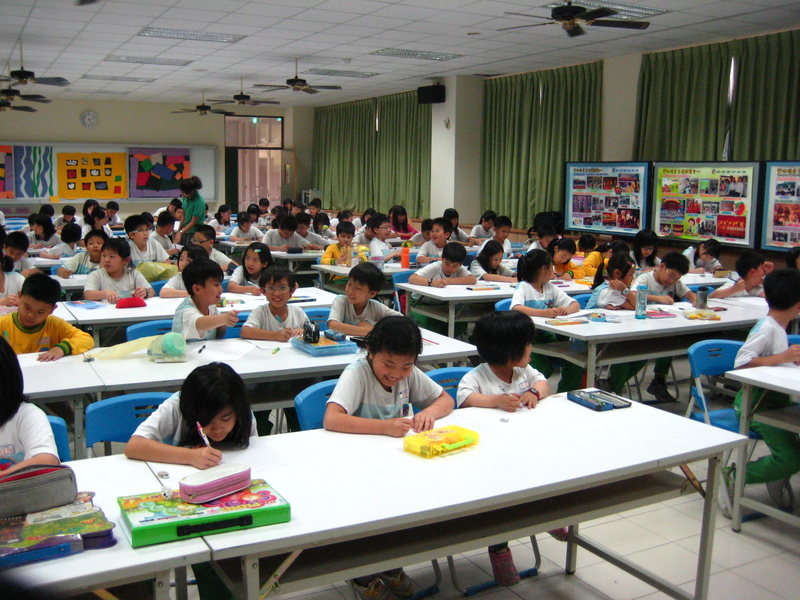 The second day would begin at a junior/ high school early in the morning. After a rather successful first day at Jungong Elementary School, I was already looking forward to the following day.